The Great Wall of China curves over the most difficult mountains and valleys like a royal dragon with such puff that the Astronauts on the moon could distinguish it from other earthly formations. I surmise that it is on so many bucket lists that the Chinese government resorted to commercialization of approved sections to accommodate constant crowds of tourist (mostly Chinese). Does this make you sick? The Mutianyu section of the Great Wall, about an hour northeast of Beijing, is catching up with the other popular sites with an enormous new plaza fronted with all kinds of tourist shops, and shockingly, Burger King and Subway and lots of hammering and digging as workers make easy access. It certainly shakes the spirituality of the moment as you pass through these things to reach the real purpose, The Wall. There is a cable car to take you up to various levels and the option to do a tube ride down in a tiny vehicle where you control the speed with an old fashioned rail-road device. Pull to slow down, push to go fast. The line can be long for that experience. When I finally crossed the threshold onto the wall, I felt history swoop through me like a tough wind. 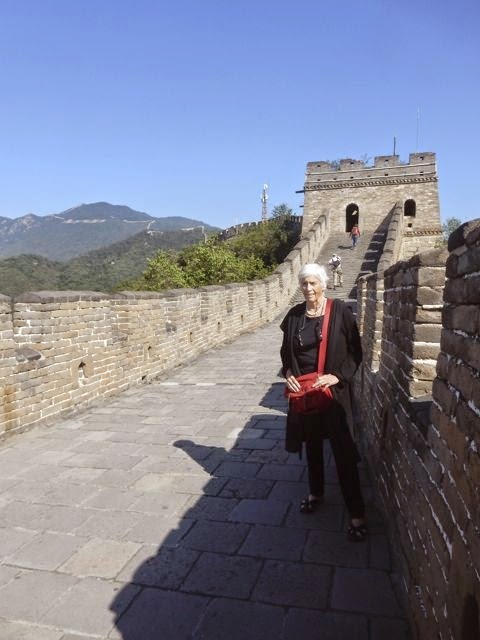 No matter how or where you enter there, you can claim that "I Have Climbed The Great Wall." It is doable and depends on your leg muscle and lungs after a week in all the polluted air. There are towers and parapets, and tiny steps, steep steps, original steps, restored steps, sometimes uncomfortable ones, designated scenic spots named Bull's Horn Ridge or Eagle Flying Belly Up, so I could imagine the days when soldiers patrolled its defensive 5000 kilometers to ward off the invading Mongoloids and nomadic warriors. 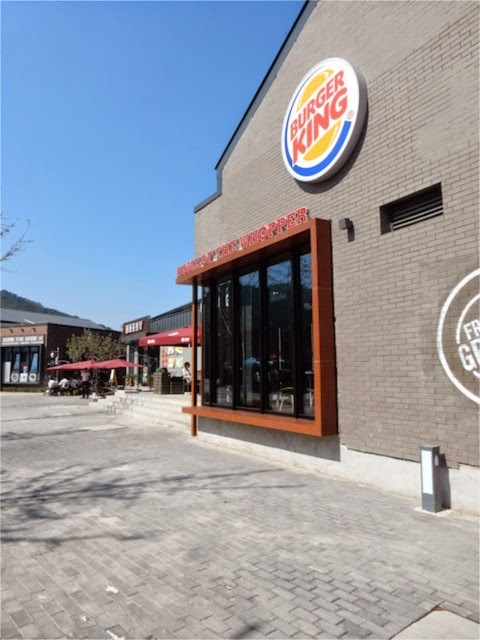 Its original bricks were put there in seventh century BC by dukes. 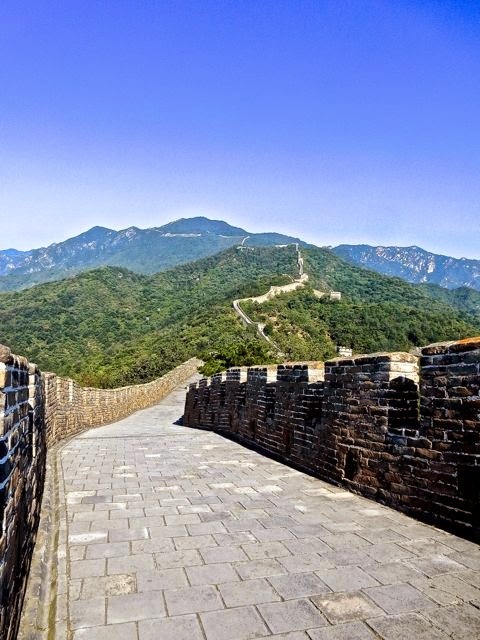 In 221 BC, after Emperor Qinshihuang unifed China, he linked all the sections together, and the wall continued to expand through the Qin, Han and Ming dynasties (up to 1644). When you stand on a tall spot and can see the wall winding across the tops of the mountains and down in the valleys, one wonders at how they got all the bricks and stones transported to the areas. I am sure there are tales of intrigue and drama and I would like to know how many lives were lost doing the dirty work. We headed through the countryside and onto free-ways until we arrived at the Beijing airport which is larger than any city I've known. I spotted a Fedex hanger. Always gives me a pang of home. But the space of things in China, is hard to fathom. We must have driven at a good pace for half hour once we had gotten to the airport grounds. In China, everything is BIG, not to accommodate foreign tourists, but for their own millions who constantly sight-see in their nation. The China Airways plane took us to Xi'an, with its verdant pastures and forests of weeping willows and poplars and aspens and tall pines. It is considered a small city with only nine million residents. (??). Our tour guide Ping with driver for Xi'an (pronounced Chi-an) was a wealth of information, took us to one of the many sites where archeological work is under way. 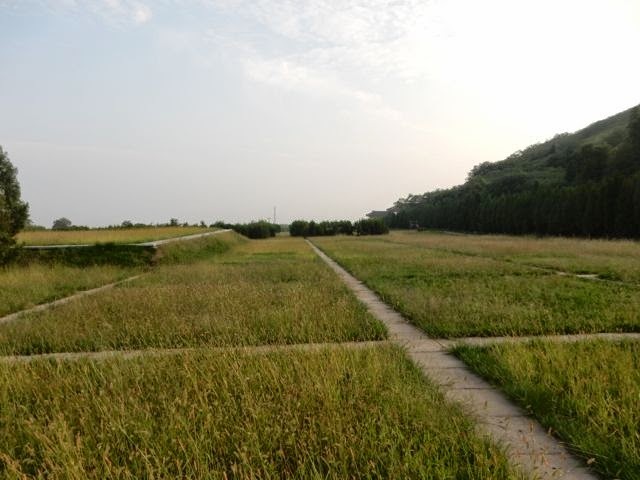 Xi'an is a green, well laid out city and environment with massive parks. The amount of money spent on the sites of excavations so that tourists can move in and out of the spaces must have been in the billions. 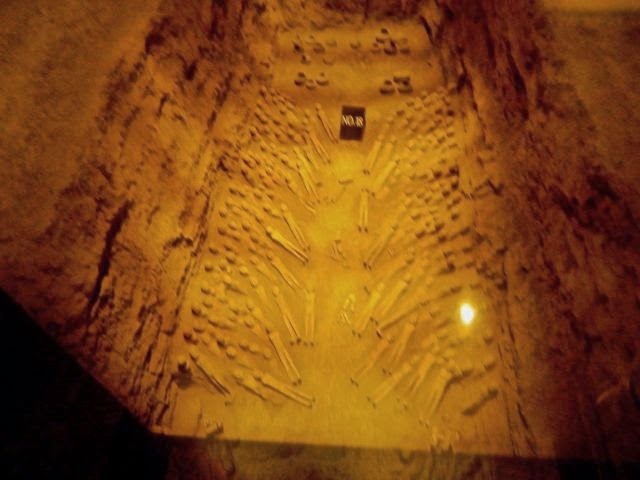 Underneath Xi'an is a trove of history, most of it never to be investigated. It seems every time ground is dug for a new apartment or factory, some part of a tomb's wealth and history appears. Meanwhile the setting is so beautiful with green fields, hills and planted trees, it takes you by surprise. 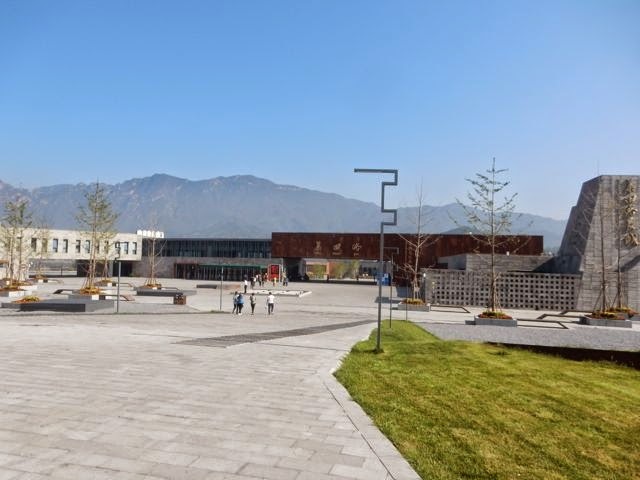 We started at the Han Yangling Museum, which was enchanting, if you can say that about something in the dirt. It may pale in comparison to the Terra-Cotta Warriors Excavations, but let me tell you, it was my favorite. Ping told me there are 72 emperors buried in the area, and we will visit only two excavations of emperor's tombs. Jing Di Emperor Liu Qi of the period 188-141 BC was not a warrior but a serious "Taoist" who ruled without disturbing or abusing nature. He and his Empress Wang share the Yangling tomb, which took 26 years to complete. With the Yang River on one side and the Wei River on the other, from a bird's view, his tomb looks like two powerful dragons protecting their mausoleum. (Sites require Dragons to be protected, and a huge circle and a square in some form to keep Ying and Yang in tact.) The massive tomb mounds became archeological sites in 1970s. 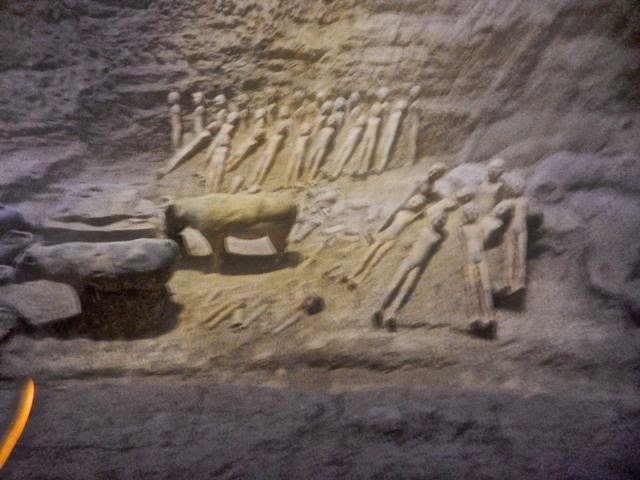 This Emperor's tomb is surrounded by 80 underground pits which are filled with unique items - like thousands of "barbie dolls" which were clay doll-like figures once with wooden arms representing concubines, eunuchs, and warriors - dolls to entertain the Emperor in the afterworld, and also pigs of different sizes, sheep and goats and chickens and dogs. 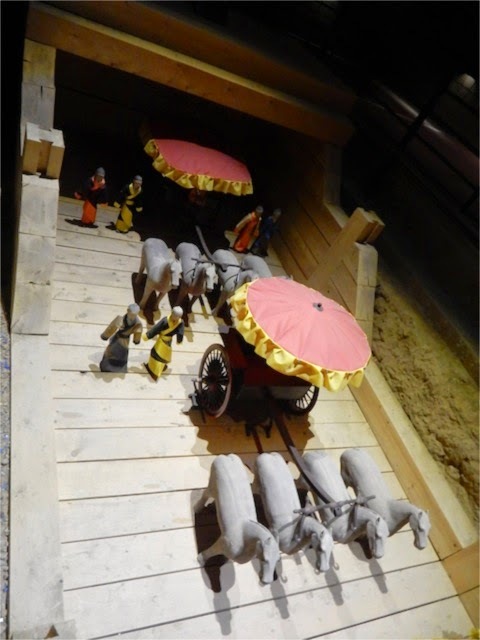 All in long rows with daily utensils (he could party big with all that he had to do it with), chariots, lutes, granaries, reproduced in the culture of the Western Han Dynasty. The excavation sites are covered in climate controlled buildings with glass encasements that allow visitors to meander and stroll even over glass floors from which you can see below your feet, the amazing collections of an Emperor preparing for the afterlife in style. Truly, I was impressed and curious about the purpose of the doll-like creatures (naked in their present state but apparently clothed in royal style back in the day). I guess they represented the people, and this Emperor wanted to make sure there were enough folk to entertainment him through eternity. Understand, Emperors began accumulating these things before his death and his family and dynasty continued the work of his desire after his death, the time of which is always unknown no matter who you are.